Norway's Northern Offshore, Ltd announce that the last two wells of a 4-well program will not be drilled at the present time. The Joint Operating Company Vietgazprom, a joint venture between Petrovietnam and Gazprom, ("VGP") has given notice that the last two wells will not be drilled at present. The second and final well under the current contract is expected to be completed by late September 2012. However, the Company and VGP are currently in discussion to formally suspend the contract to allow for the drilling of the two remaining wells during 2013, at rates, terms and conditions to be mutually agreed at the time of resumption of the suspended program. Gary W. Casswell, Northern Offshore's president and CEO, said, "While we are disappointed with the news from VGP, we continue to have a strong relationship and look forward to continuing the drilling program for them next year. In the meantime, we are actively pursuing programs for the Energy Searcher in the region, and are optimistic about opportunities for the rig with improved market conditions and increasing dayrates." 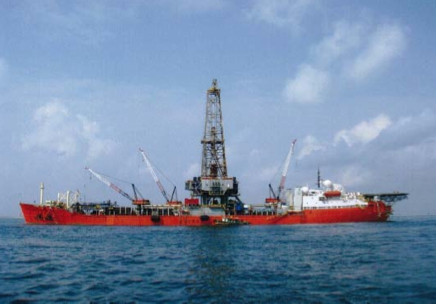 The Energy Searcher is a conventionally moored drill ship, able to operate in water depths of up to 2,500 ft. It is equipped with an 18-3/4 inch x 10,000-psi BOP stack, a Maritime Hydraulics DDM top-drive and an eight-point chain mooring system. It has a deck load capacity of 9,000 tons and is able to accommodate 110 people. Northern Offshore, Ltd. is a Bermuda holding company which operates offshore oil and gas drilling units and one production vessel in various markets around the world, including the North Sea, the Indian Ocean and Southeast Asia. The company's fleet consists of five drilling units (a drillship, a semisubmersible and three jackup drilling rigs) and one floating production facility.